Sorry the photo is not really good, and though the show was absolutely fantastic. The show? 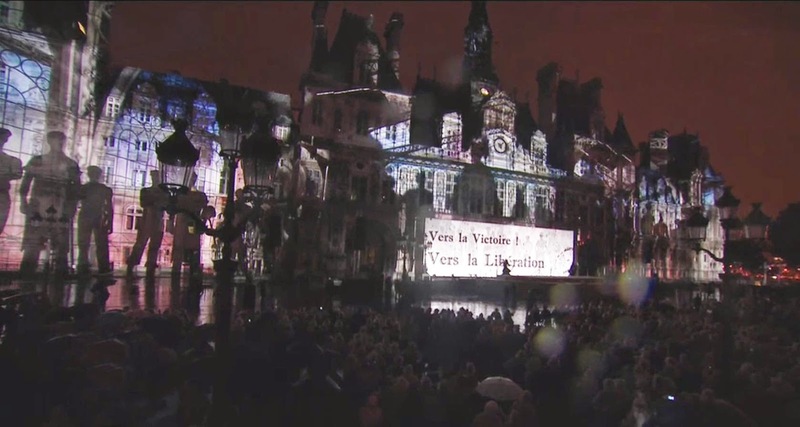 Yes, to commemorate the 70th anniversary of Paris Liberation from the Nazi, the town hall ordered a splendid light show projected on... the Hotel de Ville. Really impressive, even though the heavy rain kinda spoiled it a bit. Paris was liberated on August 25, by the allied troops with the help of the French resistance fighters. A late aunt that passed away a few years ago told me that it was a very happy day, but also pretty dangerous as there were many snipers everywhere. Sorry for the rain... The photo is a nice tribute to the Paris liberation. Can't imagine anything sadder if this hadn't happened, 70 years ago. But I can imagine the feeling your aunt experienced then... and the feeling you went through when talking about that period with her. Merci for sharing this with us. A similar light show is cast on our Parliament Buildings during the summer... this reminds me of that. People used to tell me you couldn't imagine the bells. And then they'd find it difficult to speak for a moment. This is an impressive light show for a most important time in history. This will only last a few days before France3 removes it so watch it soon. Oh thanks! That's awesome. I really would love to know about these things in advance. I keep learning about the interesting things going on in Paris... after they take place! Good thing General von Choltitz ignored Hitler's order and surrendered German forces in Paris to General Leclerc and Henri Tanguy ( colonel Roi during the resistance) on the 24th of August. Can't say whether we can call that bravery or courage but , in any case, it was a good tactical decision on his part and it saved him from Nuremberg. I think it's a pretty cool photo, Eric. I just showed it to someone here at work, who wanted to know who were the snipers. Leftover Germans?